My husband built a beautiful new website called Beautiful Strokes to sell my art cards and prints online. He is featuring 20 of his favourite paintings from my collection. When you place an order I print the cards and prints myself and we ship them to you. It’s the first time my art cards have been in an online store. Have a look and let us know what you think. We would appreciate any feedback you have. Thank you! It is so fun to paint with a friend. I love it. 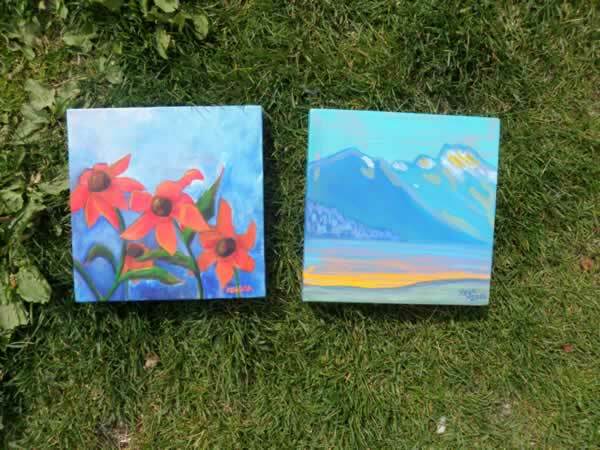 On September 10th these paintings will be raffled off at a fundraiser for the Whistler Arts Council in support of the Whistler on the Lake Art Workshops program. You can see more of Keya White’s paintings at photoscapes.ca. Last night at midnight I got home from a week of painting in Whistler, BC. I was buzzing the whole drive home. My 3 day workshop with David McEown was amazing. I LOVED it! The advanced workshop lived up to it’s name as we tackled a very complex studio piece of the Larch Trees and waterfalls near Lake O’Hara. 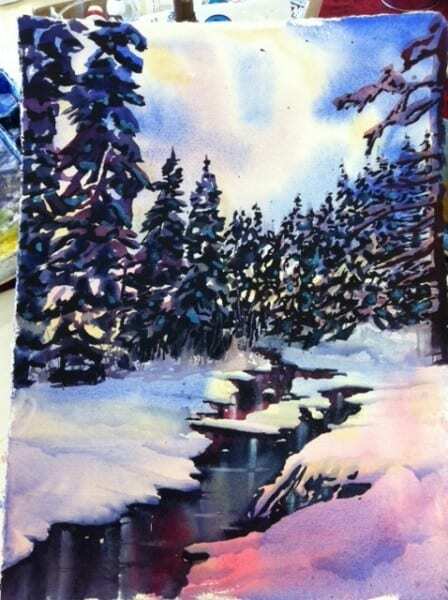 It was great to learn how to approach the layers of the painting and keep the whites in the water. 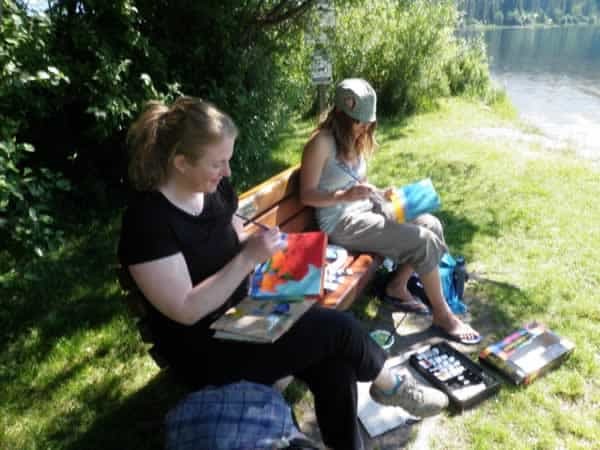 On Friday my artist friend Keya White and I biked around Alta Lake and painted 8×8 canvases to donate to a fundraiser for the Whistler Arts Council. On September 10th they are going draw the raffle winners and someone will get to take home my painting and support the Whistler on the Lake Art Workshops at the same time. I am so excited. I just sent the largest number of original paintings to Mountain Galleries that I have ever shipped at one time. I was so nervous to let anyone take my parcel. No one will insure art! 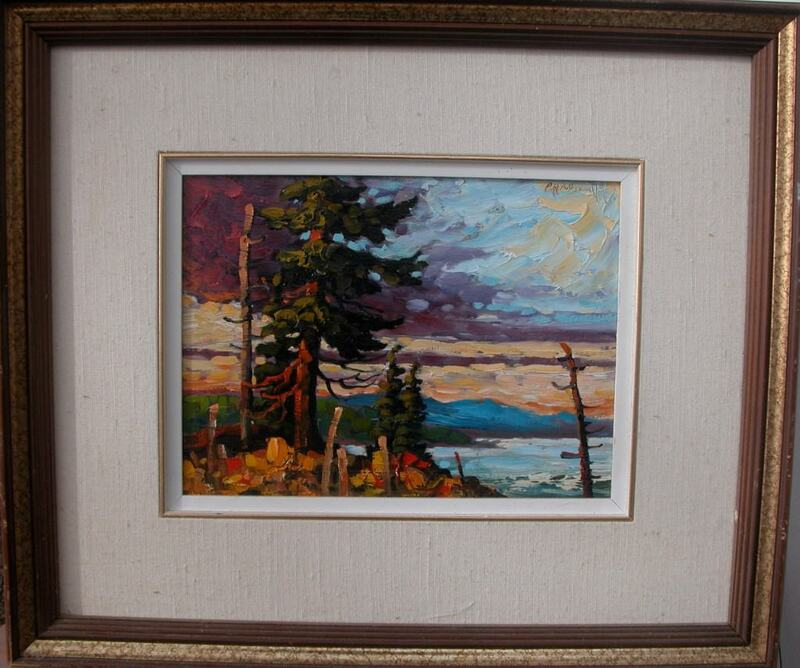 (Now maybe if I had purchased the art they would insure it for me, but since I painted it, there is no such luck.) So here I am trying to find a company I trust to take 23 of my original watercolours to Jasper. I was going to send them by priority post but Canada Post uses Fed-Ex who contracts out their work. I didn’t want my paintings going through so many hands. It took me a while but I finally couriered them by ground which insures they stay in the same cage the whole trip. This shipment was momentous for me. Firstly it is a huge honour to be an artist in Mountain Galleries along side amazing professional artists such as Alan Wylie, Jerry Heine, Gail Johnson, and the list goes on. 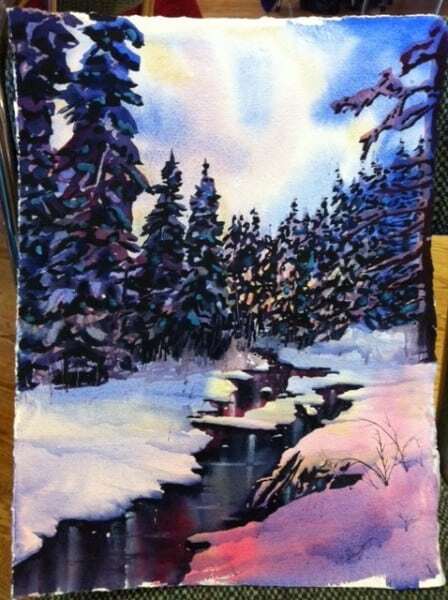 (I’m in the same gallery as Robert Genn, Brian Atyeo, and one of my favourites, Jack Reid ~ who taught me how to paint snow in 2002!) As well, this was the first time that the gallery accepted every piece I showed them! Some of the paintings will stay at the Jasper Originals gallery in the Jasper Park Lodge, which was the original gallery opened by artist and film maker Wendy Wacko. Eleven of the paintings are being delivered at the end of December to the Whistler gallery in the Fairmont Chateau Whistler by Wendy herself. This is the part I am most excited about. In March I gave my notice for my teaching job so that I could paint full time. I had just recently been accepted into the Whistler gallery and with the Olympics less than a year a way I knew I would regret it if I spent my time marking papers rather than painting. I am so glad I made that choice. Painting continuously has given me the chance to grow as an artist. When you paint in spurts it often seems like you are always starting at square one. This summer and fall I had a chance to get on a roll. It was a glorious feeling. 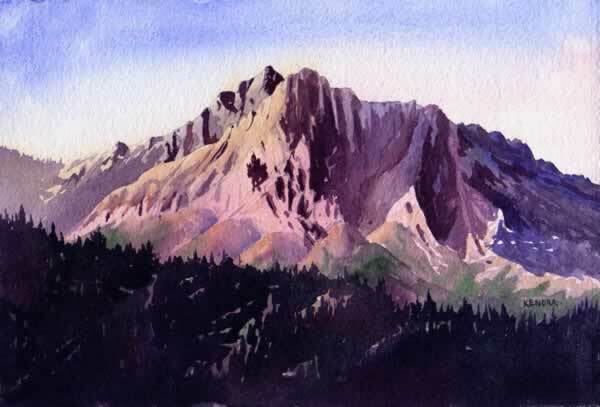 Lately I have been painting some full sheet watercolours of the mountains in Whistler. 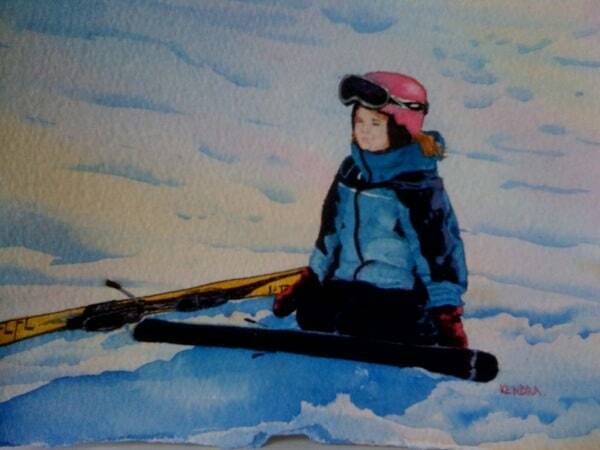 With the Olympics coming up this February, I want to make sure that Mountain Galleries is stocked up on winter paintings of the ski hill. The first painting, “Whistler’s Backyard” is a view of the snowy hills surrounding the valley with a view of Blackcomb and Whistler Mountain ski runs in the background. “Harmony”, the painting on the right, is a run leading to Harmony Chairlift with Armchair Mountain, Spearhead and Blackcomb Peak in the background. Here are some of the results from my recent painting trip. 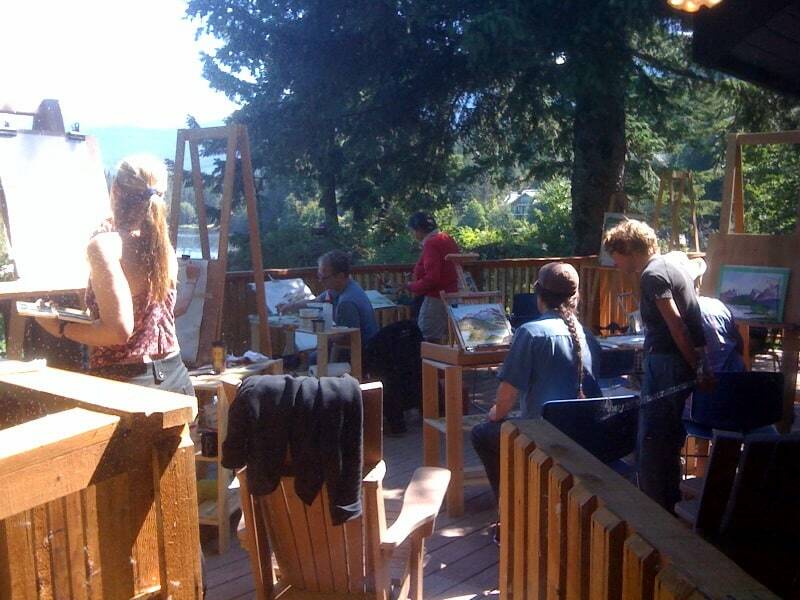 I was invited by Mountain Galleries to be their artist in residence for a week in Whistler, BC. While there I took two trips up the gondola. One day was sunny and the next completely socked in, as you can see by the painting I did of the Peak to Peak gondola. Here are three of the new original paintings I will be taking to Sun Peaks with me this weekend for the Wine and Culture Festival. After the Festival I will be leaving new artwork at Tree Line Studios in the village center. When I went to Jasper I took all of my new Whistler paintings with me. Mountain Galleries has three gallery locations in the Fairmont Hotels in Jasper, Banff and Whistler. The owner, Wendy Wacko, took seven out of my nine winter paintings to send to Mountain Galleries in the Chateau Whistler. Here is a link to view the rest of my Whistler art. I left Jasper on Monday afternoon to drive to Banff where I have been staying in staff accomodation at the Banff Springs Hotel as part of Mountain Galleries artist in residence program. It is beautiful here. Yesterday I hiked Johnston Canyon to take photos of the seven waterfalls. I also went to Lake Louise and Moraine Lake which was amazing. I got to Moraine Lake just after 8pm when the sun was about to set. The light on the mountain peaks was stunning. I was so lucky. Early this morning I drove around the Banff Springs golf course by the river to take photos of the backside of Mount Rundle. Then I hiked Silverton Falls, took pictures of Castle Mountain, drove to Lake Louise, painted a picture of Victoria Glacier and walked around the lake, stopped at Castle Mountain on the way back to start another painting, and then tonight I walked along the marshes taking photos of Mount Rundle. Neither of my paintings turned out the way I hoped today, but then again it is a bit overwhelming with all of Wendy’s advice floating around in my head and also intimidating seeing all of the awesome art in her gallery. The Mountain Galleries in the Banff Springs Hotel is so nice. 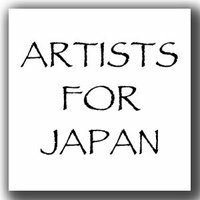 I have to remind myself that many of those artists have been painting for over 50 years. I just have to relax. I am honoured to be here painting for the same gallery. I am so grateful for my creative lifestyle and to be able to do this already while I’m still young. I have a lot to learn and a lifetime ahead to do it in. I have lots of good material to paint when I come home from my trip. I have taken well over 1400 photos! Definitely a lot of inspiration. 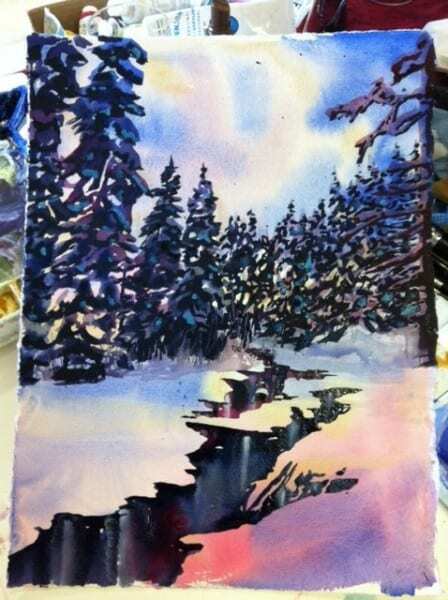 Here is a link to view the rest of my Banff paintings. 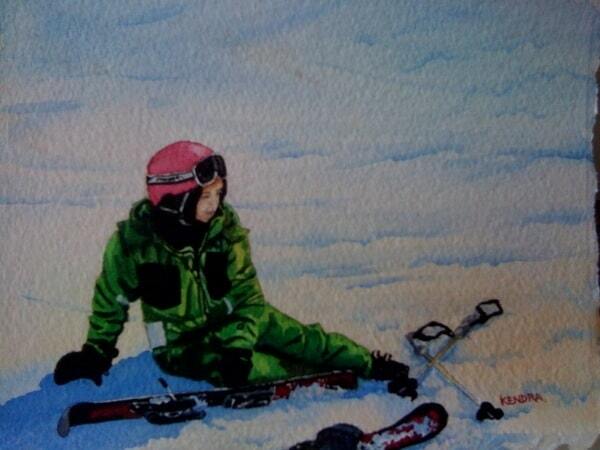 Wendy Wacko, the owner of Mountain Galleries in Jasper, Banff and Whistler, is a firm believer in painting outdoors. She invited me to come to Jasper and Banff to paint for her galleries so that I could develop some paintings ‘en plein air’. 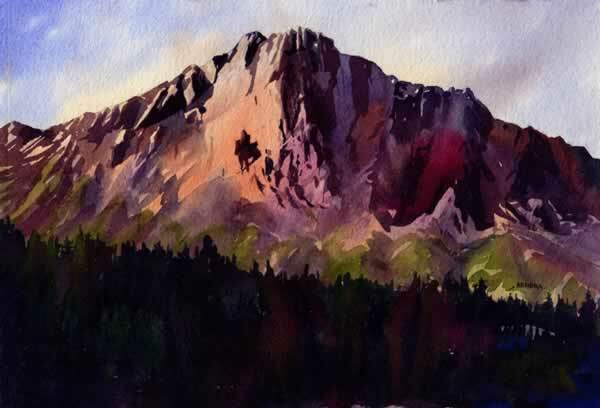 In contrast to painting from a photograph, when you are in nature the colours are so much more vibrant, the shadows have more depth, the shapes and contours of the land are easier to decipher, and the light is ever changing. Wendy told me that not every painting you do en plein air will be a master piece, but you will develop more expression in your style and a better sense of colour and light. 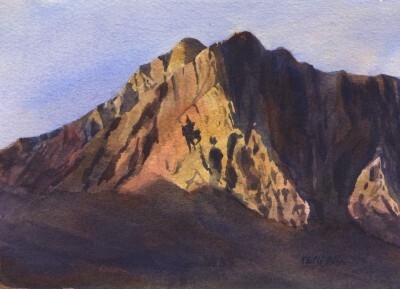 I have painted only a handful of paintings en plein air before this trip. 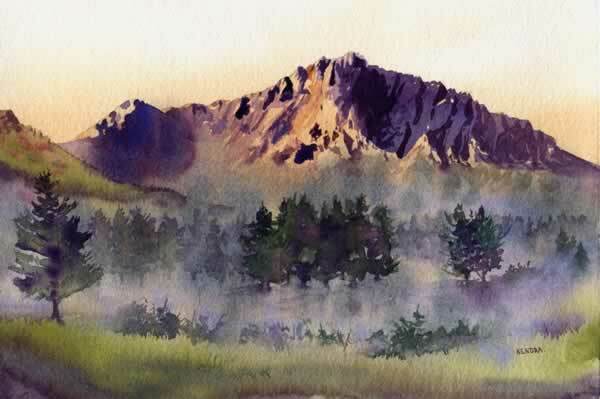 It has been so exhilerating to be outside painting the Rockies. It is so different from painting indoors. Your paint dries much faster so you need to use more water, which in turn disolves more pigment filling my paint strokes with whooshes of intense colour. The paint dries so quickly that the painting takes on a different texture than in a studio painting. It has more hard edges, spontaneous brush strokes, broad gestures of suggested shapes. There isn’t time to get wrapped up in little details when you are painting outdoors so the paintings are more spontaneous, fresh and loose. One of the tricks is trying to get a massive mountain onto an 11×15 sheet of paper. 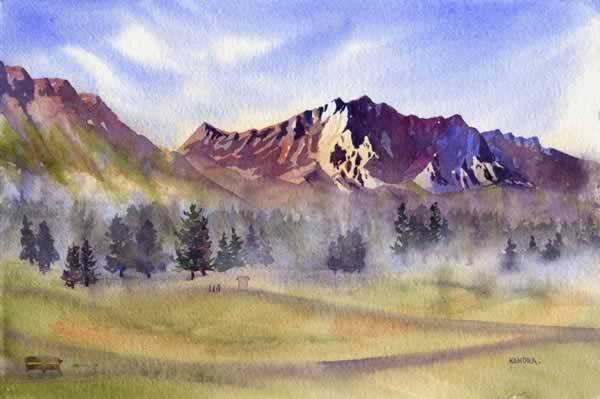 Often I would set out to paint an entire ridge and end up with a painting of one peak! 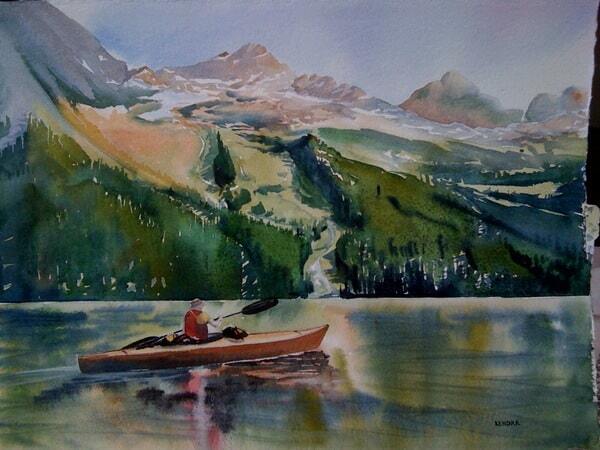 When I tried to paint Lake Louise I even ran out of room for the water, the most important part!! Painting en plein air in Jasper and Banff was a fabulous experience and I will definitely be painting ‘en plein air’ again in the future. I am soooo tired. It is after midnight and I am still at Wendy’s art studio where I have been painting as part of my week as artist in residence at Mountain Galleries in Jasper. I wasn’t going to stay late tonight but I couldn’t put my brush down. “Just one more painting”. This trip is so good for me because I am trying so many new things and releasing a lot of creative energy. It will be very refreshing to be in my art studio with so many new ideas floating around in my head. 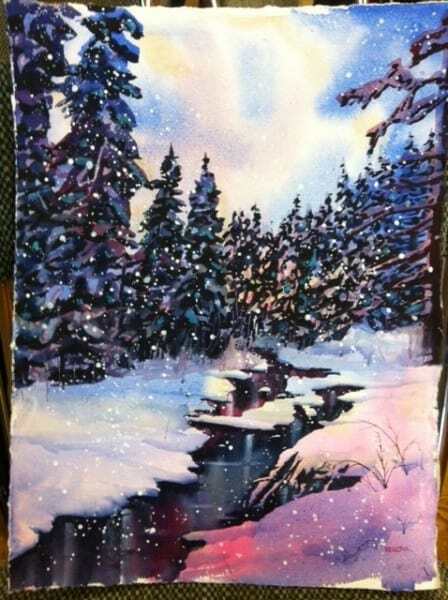 I am in Jasper right now painting up a storm. 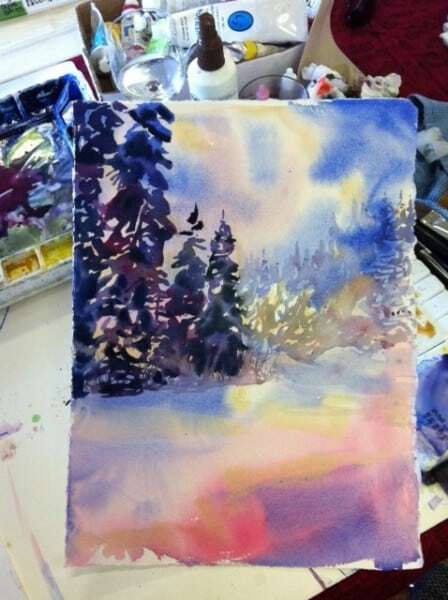 I was invited by Mountain Galleries to be their artist in residence for a week in Jasper. It is very beautiful here. I’m enjoying myself a lot. Yesterday I went on an awesome hike at the top of Whistlers Mountain with a full 360degree view – it was incredible. We haven’t had any one-on-one time yet which I’m looking forward to since she is also a successful artist. Yesterday I took pictures all day from 9am to 10pm. Today I got up at 5:30am! 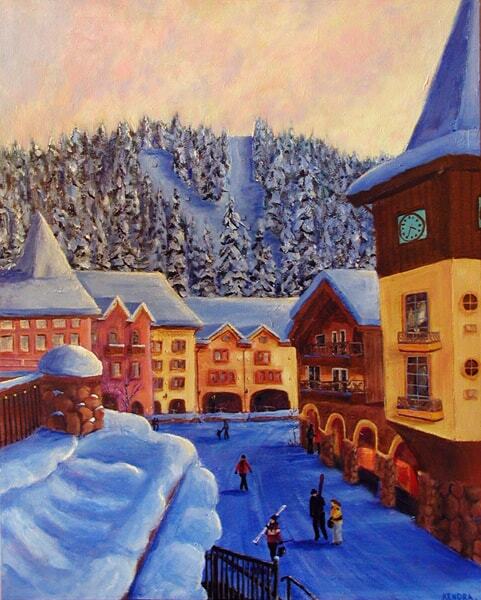 This painting will soon be available at Mountain Galleries in the Fairmont Chateau Whistler. PS It sold. This is my first full sheet watercolour painting 22×30 inches. 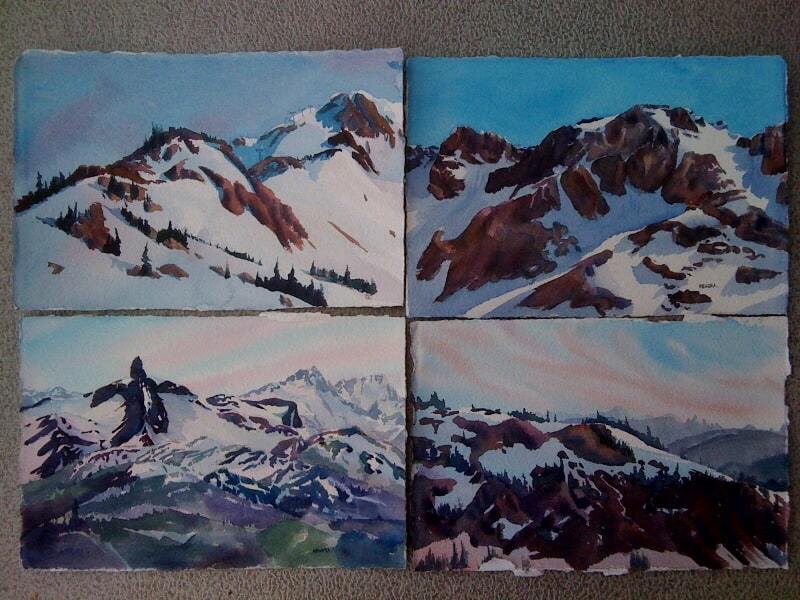 My biggest painting is of the mountain peaks in Whistler, BC. 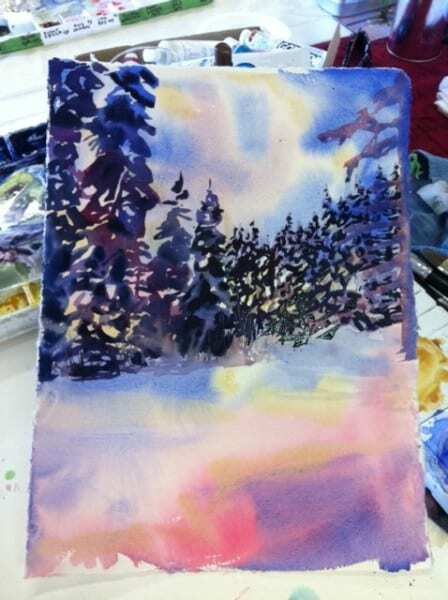 Below is another painting of Whistler mountains that I did this summer. It is a half sheet 15×22. I am really excited to be making the leap to painting larger paintings. It was my goal this summer to explore my art and to push myself out of my comfort zone. I am very happy with the results, and the best part is that I wasn’t at all uncomfortable. It was fun and I’m looking forward to painting more big watercolours.